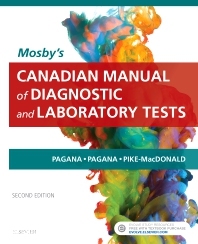 Written exclusively for a Canadian market, Mosby’s Canadian Manual of Diagnostic and Laboratory Tests, Second Edition provides clear, concise coverage of more than 700 of the most commonly performed tests, with Canadian lab values, SI units, Canadian cultural considerations, and unique Canadian content. Its many features include an easy-to-understand writing style, full-colour illustrations, and a logical organization. Each test entry is presented in a consistent format to provide quick access to information on specimen collection, normal findings, indications, test explanation, procedure and patient care, and test results and clinical significance, as well as any applicable contraindications, potential complications, interfering factors, and related tests. The second edition has been updated to reflect the latest procedures, equipment, and techniques, along with 24 of the most current laboratory and diagnostics test. Plus, updated Canadian guidelines are highlighted by a maple leaf icon for easy reference! UNIQUE! Cultural Considerations boxes highlight important aspects of working with patients from the diverse cultural and racial backgrounds of the Canadian population, such as Indigenous communities. UNIQUE! SI units in the Normal Findings section of appropriate tests offer quick and easy reference (conventional units also included). UNIQUE! Related Tests sections list tests that provide similar information or are used to evaluate the same body system, disease process, or symptom. Addresses Canadian privacy laws and legislation (including PHIPA and PIPEDA), the Canadian Labour Code, and policies for DNA collection, reporting of infections such as Chlamydia, and much more. Follows Canadian standard precautions and procedures such as those set forth by the Canadian Nuclear Safety Commission, as well as Canadian screening protocols such as those set out in the Canadian Cancer Society Screening Guidelines. Necessary consideration given to the differences between provinces/territories (and institutions) in regards to privacy legislation, obtaining consent, agency guidelines, procedure protocols and the availability of tests. Provides information on Canadian test-tube colouring classifications and guidelines for the correct order and process of collecting blood samples in Canada. Up-to-date Canadian statistics are provided for topics such as STDs and C. difficile.